The Honda ST1100 Pan European motorcycle first rolled off the production line in 1990, and was finally replaced by the ST1300 in 2002. The ST1100P (the police spec variant) was, however, available for several more years. Prior to buying my Honda ST1100 Pan European, I did some research - and found that there was no single website which had all the information I was looking for. So www.st-1100.com was born - an attempt to gather all the information about the Honda ST1100 Pan European and present it in an easy-to-use format. As with many motorcycles and new and used cars, there have been incidents in the past of certain products falling victim to a Honda recall. 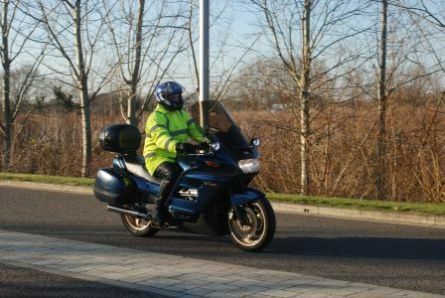 Some early models of the ST1100 ('91, '92 and '93) were recalled due to issues with the bank angle sensor, but since then there have been no major problems; it has proven to be one of the safer models released by Honda. This site has now been updated for mobile devices; however the parts pages are best viewed on a desktop screen. Don't forget to have a look through the Accessories pages as well; maybe you'll find some useful ideas for your own bike, even if it isn't an ST1100!